This piano has the best action of any 7ft grand. 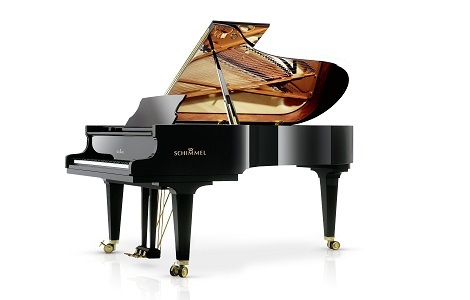 Simply put, this is because Schimmel Konzert series pianos are the only grands, of any maker, that contain the keyboard action assemblies taken directly out of a full size 9ft Concert grand piano. This means that pianists performing on a variety of different size models can always enjoy the pleasures of playing on the large-scale grand and have no need to adapt their performance technique according to different size models. Normally, as piano models become smaller and more ‘house friendly’ the strings become shorter and therefore the sweet spot for striking the (bass) strings becomes closer to the end and so the action mechanisms in smaller pianos become shorter. This shortening of the key affects the leverage ratios inside the action and thus it becomes harder for the pianist to exact complete control from shorter pianos. You will hear some makers boasting about putting longer keys in their pianos but Schimmel Konzert series are the only grands in the world where even the smallest model (K175) has a full sized Concert grand action. The concert grand size action is a nice start but it also needs an acoustic body that allows the pianist to exploit their enhanced control and turn this into a more musical performance. Here Schimmel has strived to provide the very best too. Their innovations are numerous from the enlarged, non-square soundboard within which ideal oscillation zones have space to develop providing clarity and greater tonal volume, to mass reduced bridges enabling greater dynamics and longer sustain, to patented adjustable tri-plex scale enabling a perfect blend of harmonics for every note in every piano.